The Porterfield Collegiate is not a name that nearly everyone is familiar with like the Piper Cub is. 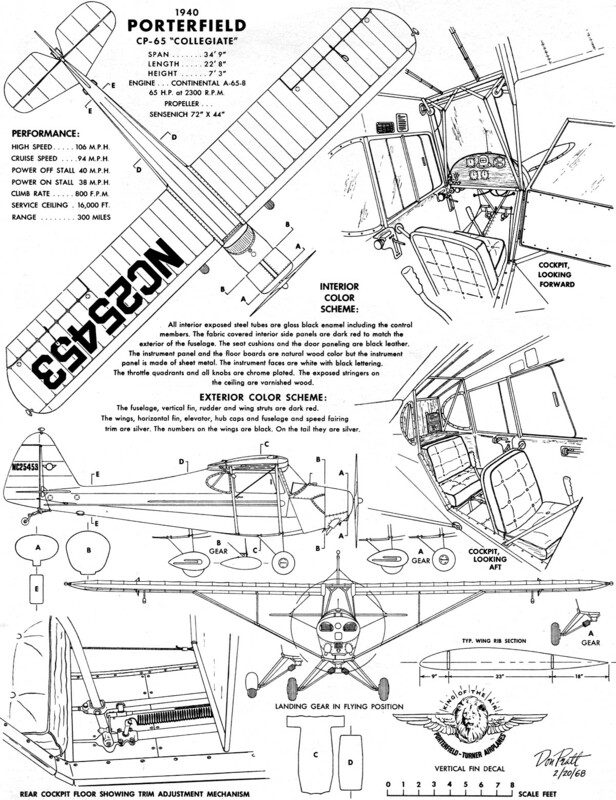 In fact, the Cub is so well-known that, like "Coke" is for mentioning colas, "Piper Cub" is often the generic term used to identify an single-engine light airplane whether it be high wing or low wing. According to this article, the Collegiate was a contender for the Cub in the pilot training realm due to the relatively low cost of ownership and the very favorable performance in terms of stall recovery, low landing speed, etc. 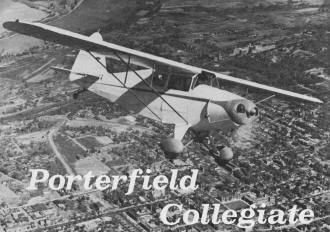 Popular for training and cross-country, the Porterfield was a rival to the Cub. The last Porterfield manufactured and sold - in 1941 - was the CP-75. Here the prototype makes a trial run over Kansas City, Mo. In July of 1931, Ed Porterfield sold his controlling interest in the American Eagle Aircraft Corp. He had been its founder, president, and general manager. He had watched it grow from a meager one-airplane beginning in the spring of 1926 to where in 1929, it stood as the third largest manufacturer of nonmilitary aircraft in the World. He had planned, struggled, and hoped in vain as his brainchild became another victim of the great depression of the 1930's. Ed stayed on with American Eagle as Sales Manager through 1931. Looking out through the glass door of his office into the plant area he watched as the workbenches were vacated one by one. Then finally, the assembly line stopped moving and half-finished airframes stood in forlorn silence in the darkened factory. American Eagle closed its doors forever in the early summer months of 1932. Embittered, Ed Porterfield went into retirement and swore never to build another airplane. Two years later a set of circumstances involving 16 high-school students, an unemployed engineer, and an unsuccessful 3-cylinder gasoline engine would cause Ed to re-enter the airplane business, and to produce and sell another 1,067 airplanes under his own name, and to build another 1,000 under subcontract for Waco. With a WW I surplus J-1 Standard trainer, Ed Porterfield learned to fly in 1925; he founded American Eagle Aircraft in 1926. 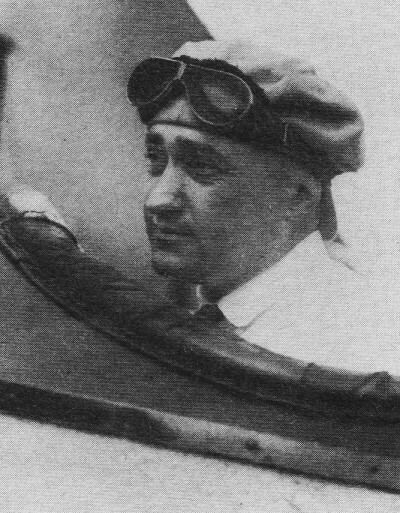 Noel Hockaday had been American Eagle's last designer, and was the one responsible for the remarkable Eaglet ultra-light monoplane. He would later design the famous Rearwin Sportster, Speedster, and Cloudster monoplanes, and all models of the Porterfields. However, in 1933 Hockaday was unknown, and for most part unemployed. 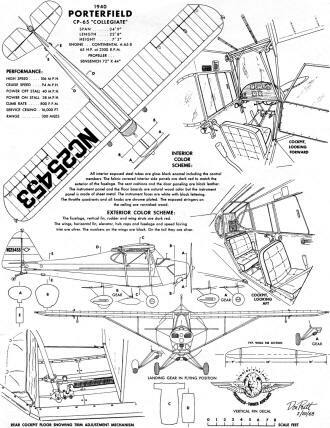 Doing odd welding, drafting, and mechanical jobs during the day to make ends meet, Noel worked nights designing an ultra-light high-wing monoplane envisioned as an improved Eaglet. The airframe was designed to be fitted with a 3-cylinder 40-hp radial engine created by another unemployed engineer named Guy Poyer. Poyer had several prototypes of his engine built and running, one of which was undergoing tests for government certification. At about the same time, Hockaday finished the detail design work on his tiny airplane, the Aviation Club of Wyandotte High School in Kansas City, Kan. began casting about for a suitable design airplane to be built in the school manual training shops. Fate took a hand and brought the two together. During the 1933-34 school year, the Hockaday airplane took shape in a converted maintenance shack at the edge of the high school playground. In May of 1934 the Hockaday Monoplane, now christened the Wyandotte Pup took to the air for the first time. One of the interested bystanders was Ed Porterfield. Ed was sufficiently impressed with the performance of the "Pup" to offer to buy it, and the rights to its manufacture, right on the spot. The deal was made and the Pup became the first Porterfield, the prototype of the model 35. The "Wyandotte Pup" became the first Porterfield, Model 35. It was certified with several engines - one of which was the 5-cyl., radial LeBlond. This Model 35 appeared at the 1966 fly-in held by the National Antique Airplane Association at Ottumwa, Iowa. Before the model 35 could be marketed, more development was needed. The plane was stable, responsive, and pleasing to control, but terribly underpowered. Guy Poyer's engine would have to go. A 3-cylinder Szekely radial engine was fitted in its place but little improvement in performance was attained. Next, a 40-hp 9-cylinder Salmson radial was installed in the 35. The little kite still played land-lover. Finally, a 50-hp Velie 5-cylinder radial engine from a wrecked 1928 Mono-coupe was mounted. Success! During certification tests the improved 70-hp Velie became available and this powerplant was substituted for the original 50-hp model. The 35 also was certified with the similar 60-hp LeBlond in 1934, and later in the fall of 1935 with the 90-hp Warner. Despite the lean airplane market of the great depression of the 1930's, the Porterfield became an immediate sales success. By mid-1936, three airplanes per week rolled out of the modest factory building in Kansas City, Mo. No small part of the sales success of the Porterfield 35 was due to the installment purchase plan offered by the factory. At a time when most airplane factories sold their products on a cash basis only, a Porterfield 35 could be purchased for as little as $495.00 down and $96.00 per month. Judged against its contemporaries, the model 35 was a good airplane. But Porterfield was not satisfied. His aim had always been to produce airplanes ideally suited for the training role, but a training plane must have safety as one of the prime considerations. In 1936, airplane engines were unreliable. Valves failed, connecting rods broke, engines stopped oiling and seized for no apparent reason. Venturing out of gliding distance from a flat open field was taking a long chance. By early 1937, Ed Porterfield had decided to start development of an airplane engine on his own. This action became unnecessary as a new generation of engine manufacturers stepped in and solved the riddle with a totally new design layout, the flat, opposed 4-cylinder air-cooled engine. In the early spring of 1937, Lycoming, Franklin, and Continental came to the rescue of the light aircraft industry. They introduced 40- to 50-hp, 4-cylinder, flat-opposed engines, making them available economically in large quantity. Porterfield ordered the Model 35 redesigned to take the new engines. Thus, the prototype of our feature model was born. The redesigned 35 became the CP-50 with the 50-hp Continental installed. It became the FP-50 and the LP-50 with the Franklin and Lycoming engines respectively. Later, in 1938, when 65-hp versions of the same engines became available, the airplanes became CP-65, FP-65, LP-65. In 1941, just before World War II terminated civilian aircraft production, a deluxe 75-hp version of the CP-65 was developed and a few sold. This model was known as the CP75. Ed Porterfield went into semi-retirement at the end of World War II. He had spent the war years building Waco CG-3 troop-carrying gliders for the U. S. Army Air Corps. in plants at Kansas City, Kan., and Ft. Smith, Ark. He passed away from a heart ailment on August 29, 1948. Scale effect given the proper amount of consideration, one can say that generally, if the full-size airplane was a good flyer, so the scale model will also fly well. I have not had the pleasure of flying the model, but I can speak well for the full-size CP-65, having spent about 100 hours in the "pit" of one during my tender late-teen years. When 40 to 50-hp. 4-cylinder, flat opposed aircraft engines, such as the Continental, became available, the Porterfield Model 35 was redesigned and designated the CP-50. Later, as horsepower went up to 65, this designation changed to CP65. A CP-65 is shown. Though looked upon with horror by modern students accustomed to tricycle landing gears, control wheels, and fly-by-itself stability, the Porterfield was considered quite a docile bird during its day. In level flight it felt like a Piper J-3 Cub, only heavier and quicker to respond to the aileron control. It was a slow machine. The factory claimed 92-mph cruise. Most of them flitted along at 80 to 85. The CP-65 did not want to stall, but it approached the stall smoothly, without buffeting or shuddering. It maintained this smoothness right up to the point where it suddenly quit flying and dropped. Once stalled, the Porterfield spun freely with a rate of rotation that was surprisingly rapid for a light airplane. It recovered from a spin just as quickly and easily as it entered one, rotation stopping instantly upon application of opposite controls. When stalled hands-off, the CP-65 would tip its nose over and drop until flying speed was again attained. It would then level itself out and come to the cruising attitude without control correction being required by the pilot. The Porterfield was capable of all primary acrobatic maneuvers, but was not an ideal acrobatic airplane. It was too stable. Whenever rolled to the inverted attitude, the CP-65 would try to right itself. If, while inverted, a pilot allowed the airplane's speed to decrease, it would roll right-side-up all by itself, and no contrary application of the controls would stop it. The CP-65 was one of those good airplanes of the past. It makes into an interesting out-of-the-rut model you can be sure will draw attention at the local flying site on a Sunday afternoon. 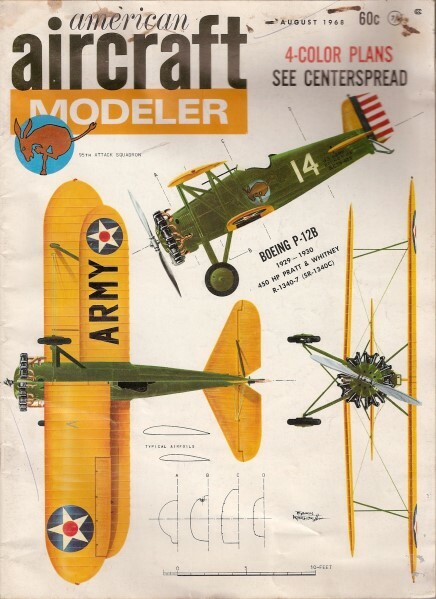 A 6 ft. R/C model Porterfield was featured in the June issue. With this article and drawings a true-to-scale model can be made with adequate information for the scale judges at a contest. Ed. 65 H.P. at 2300 R.P.M. HIGH SPEED ................ 106 M. P. H.
CRUISE SPEED .............. 94 M.P.H. POWER OFF STALL ........ 40 M.P.H. POWER ON STALL ......... 38 M.P.H. CLIMB RATE ................ 800 F.P.M. SERVICE CEILING .. 16,000 FT.
All interior exposed steel tubes are gloss black enamel including the control members. The fabric covered interior side panels are dark red to match the exterior of the fuselage. The seat cushions and the door paneling are block leather. The instrument panel and the floor boards or. natural wood color but the instrument panel is made of sheet metal. The instrument faces are white with block lettering. The throttle quadrants and all knobs are chrome plated. The exposed stringers on the ceiling are varnished wood. The fuselage, vertical fin, rudder and wing struts are dark red. The wings, horizontal fin, elevator, hub caps and fuselage and speed fairing trim are silver. The numbers on the wings are black. On the tail they are silver.